Voorneman, an industrial design student at the Technical University in Delft, the Netherlands, was going to design a child's toy for her master's thesis, as that has been her specialty, but her thesis supervisor had another idea. 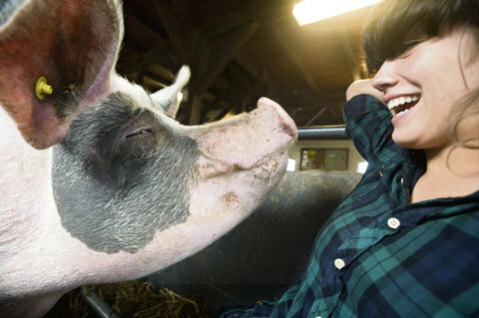 When Voorneman heard that he was looking for a distraction for farm pigs, her reaction was "I'm not going to design for pigs!" 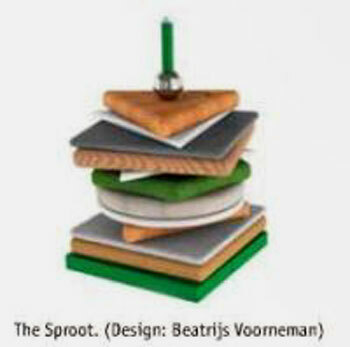 The Sproot: Design: Beatrijs Voorneman After six months of pig-studying on farms in the south of the Netherlands, she learned that pigs are very curious and opportunistic, but they are easily bored. She created a pig toy she calls the Sproot, a play on the word 'root,' the behavior wherein pigs shuffle dirt with their snouts in order to uncover whatever might be beneath it. Snoot is made of several layers of hard, but edible, materials. The tile layers are stacked on a spindle and the stack makes a noise when it is dropped or moved, which the pigs enjoy. It is hoped that the Shoot will last up to three months before needing replacement. Better than biting other pigs' tails. That's the grunt for today!